The Sangre de Cristo Range at sunrise after a light snowfall, October, 2014. 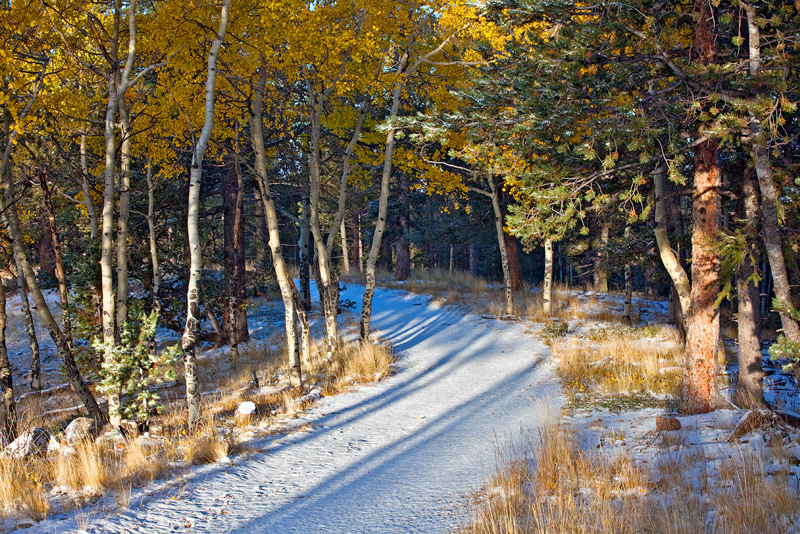 Every year, I make a pilgrimage to Mueller State Park to photograph the fall colors after the first snowfall of the season. This is usually sometime in October; this year it fell on October 13th. Mueller is a hidden gem of a park in any season, but it’s especially beautiful in fall, and after a light early snowfall, it’s a place that will bring you goose bumps. I had scouted the park the week before this shoot, in order to find the best spot for a planned sunrise shot. It looked like a couple of storms would move through the area in the coming week, and I was pretty sure at least one of them would bring some snow to the park. The first storm proved to be a bit too warm, and all the snow fell above the park’s elevation, which ranges from about 9-10,000 feet. The next storm was starting to weaken as it approached eastern Colorado, and I was starting to get nervous. I watched the park webcam the afternoon before my planned sunrise adventure, and as it got closer to sunrise, the parking lot at the visitor center just looked a bit wet, with no snow to be seen. Finally, just as it started to get too dark to see anything from the webcam, I noticed a light coating of snow on some of the structures in the background of the lot, and I was convinced that there would be enough snow to make the sunrise interesting. I got up a couple hours before sunrise, and as I drove up through Woodland Park and then Divide, I could see the light snow on the sides of the road. By the time I got to Mueller, there was even some snow in the road on some of the windy curves that lead up through the park, and it was clear that I was the first vehicle to make the drive up the park road that morning, so I had sunrise all to myself. I hiked a bit up Overlook Trail, and took some time lapse of the clouds rolling off the west side of Pikes Peak and out towards the south and west. The glow on the Sangre de Cristo Range in the distance was beautiful, and I took the photo at the header of this story. I could even make out the 14,000 peaks of the Crestone group on the left side of the photo, more than 70 miles away! 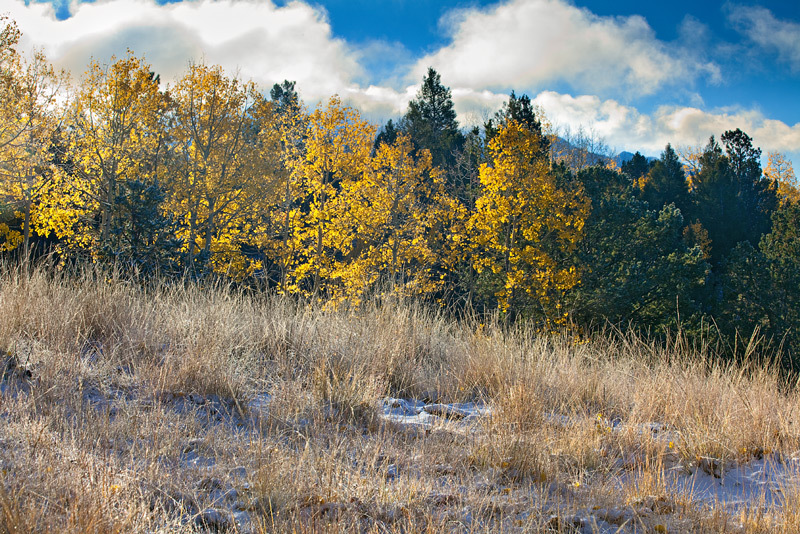 I took a number of photos as I hiked back along the trail; the light was magical as it shone through the brilliant aspen trees and onto frosty ground and grass. Usually, the “magic hour” that is best suited for photography last about an hour after sunrise (what a coincidence…) but this morning, the light and colors just kept on shining well after sunrise, so I spent all morning photographing the snow and aspen. 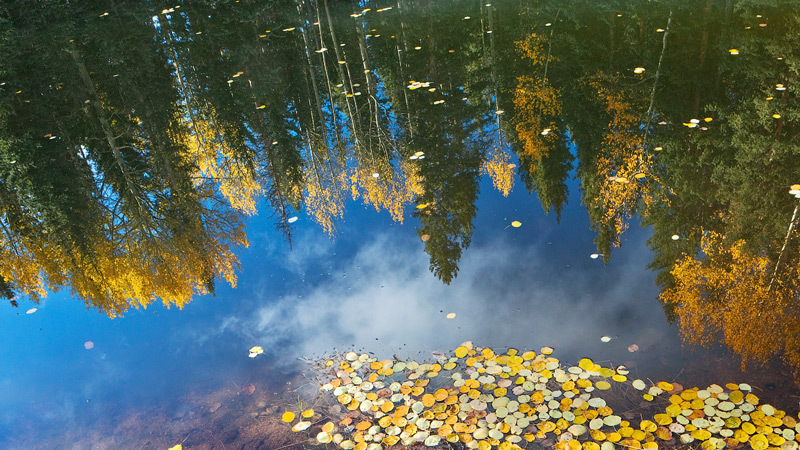 My favorite spot was at Peak View Pond, where I found some great subjects in the leaves and reflections. 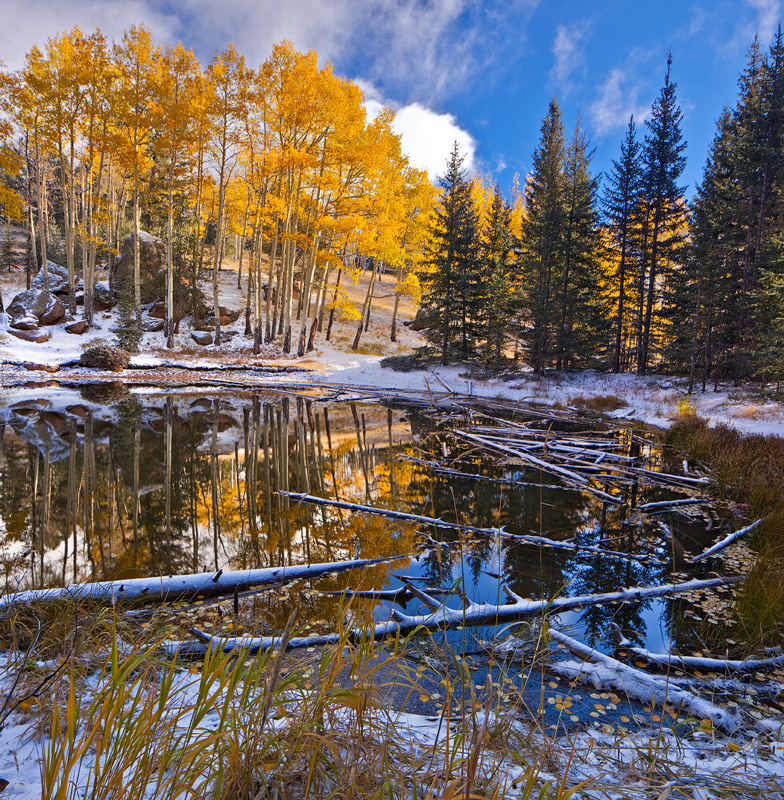 Peak View Pond, October 2014, after a light snowfall. 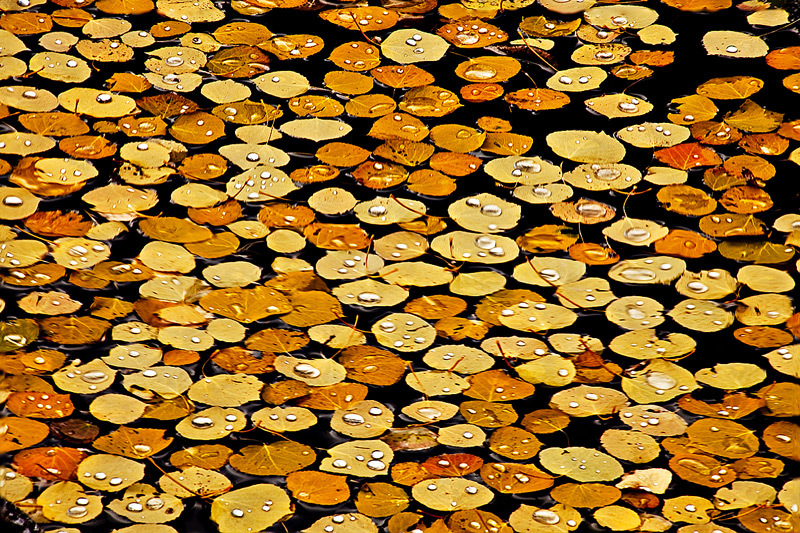 Aspen Leaves on a pond in Mueller State Park. There’s only one first snow at Mueller each year, and I already am looking forward to next year, for this great combination of magic in the company of Pikes Peak and the aspen forests of Teller County. Reflections in a pond a Mueller State Park.